We’d love your help. Let us know what’s wrong with this preview of All Good Things by Perry Prete. Ethan comes face to face wi One man kills people. To ask other readers questions about All Good Things, please sign up. Perry Prete takes his real life work and twists it into fiction novels, giving his books the feel of being a true story. I love Tom, Ethan’s hunky sweet partner. Does his job the way you wish everyone would. Tom is one special guy and, if I ever need an ambulance, I hope he shows up. He is a gentle caring, patient man. It started out a normal day at work, but not when we reached apartment 318. He, literally, stepped in it. He noticed something odd…it looked like an upside down cross brushed on th Perry Prete takes his real life work and twists it into fiction novels, giving his books the feel of being a true story. It started out a normal day at work, but not when we reached apartment 318. He, literally, stepped in it. He noticed something odd…it looked like an upside down cross brushed on the victim’s forehead. He felt the need to follow up on the call. He couldn’t let it go. An upside down cross has many meanings, one of which is a public execution. He found there was more than one curious death. His bud, Galen, is the lead on the murder case. They are close friends, playing off each other. Galen is sort of a red headed British overweight Columbo. What a fabulous description is that. Makes it very easy to picture him, and we do see a lot of him. The humor is understandable. Like anyone in a high stress job, humor helps people get through the bad. The urinal scene had me cracking up. Boys will be boys. He calls Ethan and the game is on. Why is he being singled out by the killer? I got a bit of a rush from that ambulance ride. Oh man, there is so much sadness. The deaths become more gruesome as he comes into his own. And this may so sick, but I am enjoying it more. The darker, the more evil the villain becomes, the more I love him. The pacing kept the suspense on an even keel, always there, endangering the characters. The more I get to know the characters, the more I like them, even the evil villain. I think Tom is my favorite though. This is Perry Prete’s first novel and it was a great one. Very well done. I loved it. Some great characters, plenty of murder and mayhem, loss and love, danger and evil. I am not sure what’s missing. why am i not blown away, because it has all the thing I love…could it be romance? Of course, this is a series, so maybe he’s saving that. You know, a slow burn instead of a hot flash. I look forward to reading more of his work, watching him grow as an author, creating more mystery and suspense, because…there is one question not answered. The story could end here, or, it could come to life in the next book. I voluntarily reviewed a free copy of All Good Things by Perry Prete. Whilst I am not usually fond of short stories, I did enjoy 'The Things that Matter Most'. I am not going to say what the story is about for fear of spoiling for others, but I will say that it is a murder mystery and quite a page turner. Recommended. Received an electronic copy in exchange for an honest review. I won a copy of this book as part of the free reads program on goodreads.com. I had tried it and then had to set it up for a bit and then couldn't get back into it. I had mentioned that on goodreads and the author got in touch with me and encouraged me to give it another chance and also got in touch with me a couple of weeks later to see if I had gotten a chance to read it yet, that was just the kick I needed I had nothing important to do this afternoon so I sat down and read it in about 3 hours I won a copy of this book as part of the free reads program on goodreads.com. I had tried it and then had to set it up for a bit and then couldn't get back into it. I had mentioned that on goodreads and the author got in touch with me and encouraged me to give it another chance and also got in touch with me a couple of weeks later to see if I had gotten a chance to read it yet, that was just the kick I needed I had nothing important to do this afternoon so I sat down and read it in about 3 hours. I really did like it once I got into it. 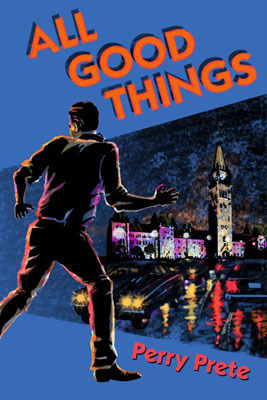 I have never read a book anything like it, its a murder mystery but the twist is the main character is a paramedic and it is set in Ottawa, Canada. It shook my preconceived notions about paramedic. I can't wait for the sequel. I received a free copy of All Good Things via a Goodreads giveaway. I really liked this book. The story and the characters are excellent. I really liked how there were times when the story shifted to the killers perspective. And what a killer. Only one word can describe the killer...TWISTED! I look forward to reading the next book. Thank-you Goodreads and thank-you Perry Prete. I received this book as a Goodreads give-away. I really enjoyed this book. It kept me guessing and suspecting. Plus it left me waiting for the next book to come out! Just enough unanswered things to make his next book a definite must read. A valiant first effort! It shows promise, and there were sections I couldn't put down. But, please, Mr. Prete, find yourself a good editor, and a printer with better quality control. I won this on a Goodreads giveaway. A good page turning book. Perry did a great job writing this book! !